Confession: Up until a few years ago, I wouldn’t eat spinach. It wasn’t that I tried it and didn’t like it- I just assumed I wouldn’t like it, so I didn’t eat it. My husband talked me into trying it one day and I was surprised by how good it could taste. The first version I started eating was just frozen spinach. He would take a bag of frozen spinach, one can of low sodium chicken broth and some garlic and boil it together until tender. Seriously, it’s GOOD. The past year or so I started experimenting with using spinach in other ways- adding to spaghetti sauce, meatloaf, protein shakes…anything! 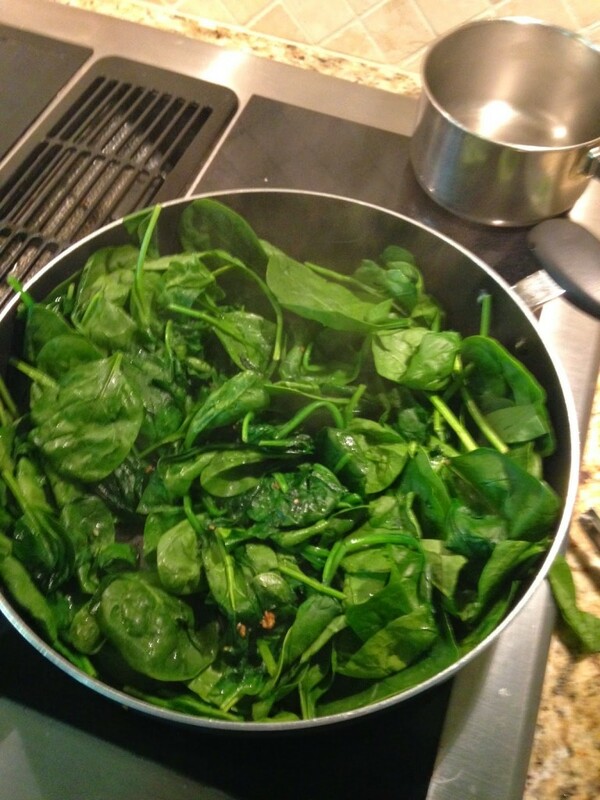 I also started cooking fresh spinach and have been surprised by how easy and quick it is. I posted a picture on facebook one night of sauteing some spinach and was surprised by how many people that posted and had never tried it, either. I thought it may help someone who is on the fence and doesn’t know HOW to prepare it for me to give a few pointers. 1- Buy the BIG bag of spinach. At my Wal-Mart it costs $2.88 for the large bag. We either buy the plain spinach or the Power Mix which is spinach, kale, and some other type of greens. Both taste about the same to me. 2- Use your biggest skillet with a lid. Trust me on this one. 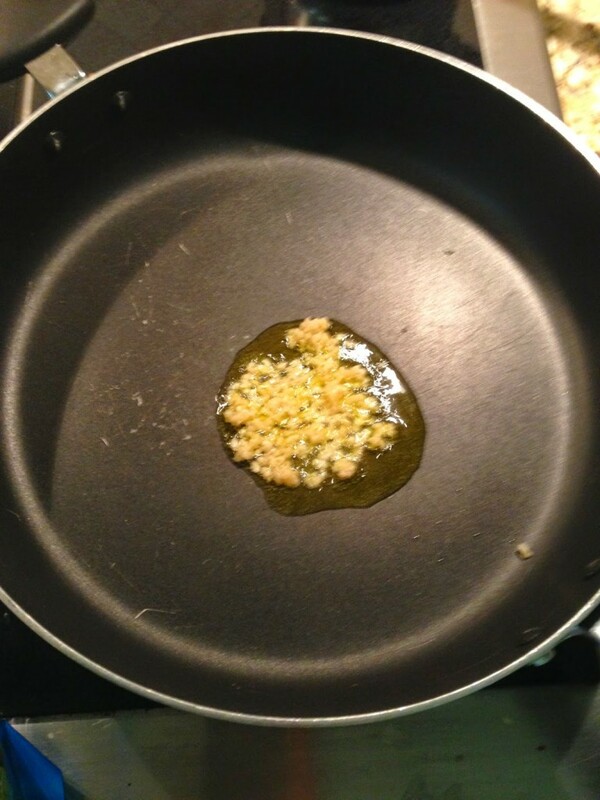 3- Heat your skillet and add some extra virgin olive oil and garlic. 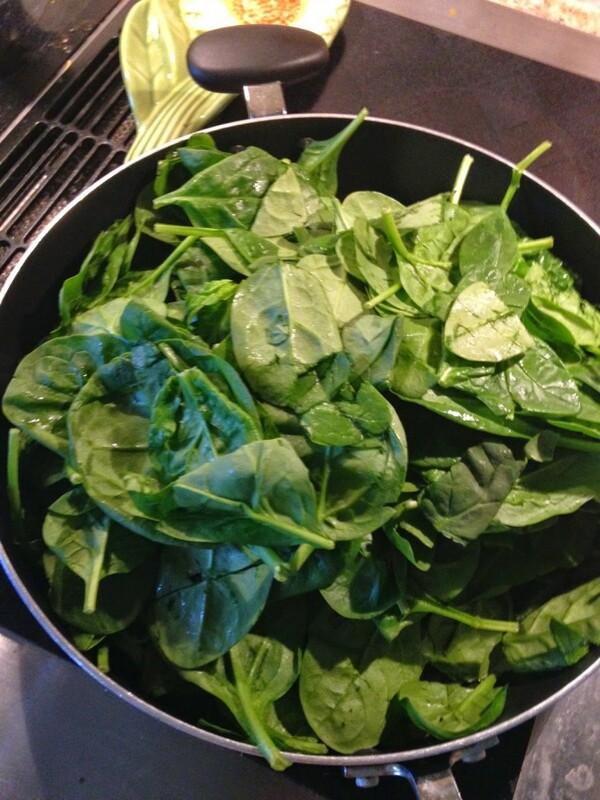 4- Once your oil is heated up, add the entire bag of spinach. Your pot will literally be overflowing. I mash mine down in so it will all fit. Some pieces still fall out. 5- Add a splash of chicken broth (I keep a carton of this in the fridge at all times. It’s GREAT for adding flavor to veggies, quinoa, rice and soups). Once you’ve added the broth, put the lid on and give it 1-2 minutes to cook down. 6- After letting it cook 1-2 minutes, take the lid off and stir. I use tongs because it’s easier to get it stirred up good. It will wilt as cooking and get smaller. Put lid back on. 7- Cook another few minutes, then sprinkle with sea salt if desired. Done in around 5 minutes. SO GOOD for your body, and so delicious!!! 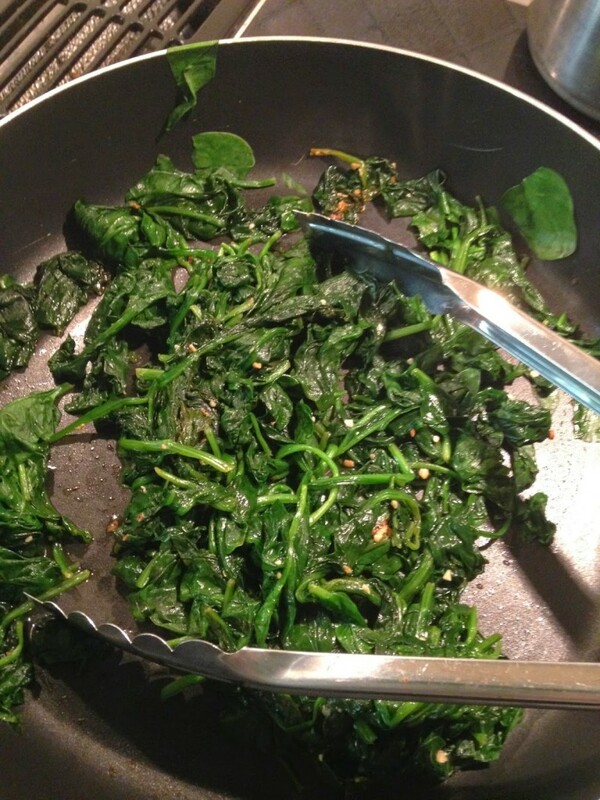 I saute spinach with coconut oil too-delicious! I also add some sliced, fresh mushrooms and chopped pecans. Sounds odd but tastes great!